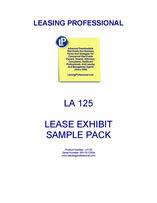 This lease exhibit sample pack contains an assortment of commercial lease exhibit forms that can be modified and adapted to fit the particular nature of individual leasing transactions. 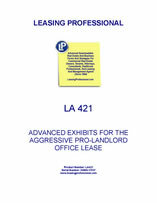 These pro-landlord lease exhibits contain a detailed work letter with shell specifications about what is provided in the base shell by the landlord, a letter of credit form, a form of tenant estoppel, and a subordination agreement. 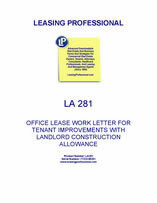 A short form of lease for recordation, forms to document that purchase options and rights of first refusal have not been exercised by the tenant (in the event that is the case), and a schedule showing removable and nonremovable tenant improvements are also included.